London Wasps half-back Nic Berry has announced his immediate retirement from the game due to a series of concussions. 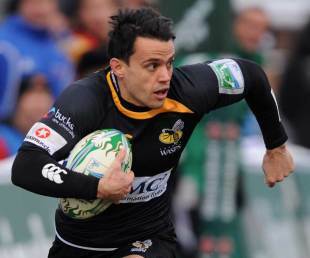 The scrum-half has suffered numerous knocks to the head over the years but was passed fit to start this season for Wasps. But in their opening match of the campaign with Harlequins, he was forced from the field with concussion in the 72nd minute of the match. Following consoltations with a specialist, Berry has opted to call time on his career. He made 45 appearances for Wasps since joining the club ahead of the 2010-11 season and he has wished the team well going forward. "It is with great sadness that I have been forced to retire from the game that I love," Berry said. "As players we understand that injury forced retirements are a reality of the sport, but it's still hard to believe that I've played my last game. Rugby has been a huge part of my life up until this point and I have been fortunate to play for some incredibly proud clubs. "I wholeheartedly believe that with the coaches and playing squad Wasps currently have, the club is capable of achieving some great things. I would like to thank all the supporters, players and staff, in particular Dai Young and Doug Jones for all the support they given my family and I throughout my time here at Wasps." Wasps boss Dai Young had to cope with a number of his players retiring last season with Joe Worsley, John Hart, Tom Rees, Dan Ward-Smith and Steve Thompson all calling time on their careers and he paid tribute to the scrum-half. "It's very sad news for everyone at the club that someone as talented as Nic has been forced to retire in his 20s," Young said. "He has been a fantastic player for Wasps over the past few seasons, but more importantly he's a fantastic person to have in your squad, someone who always works incredibly hard to get the best out of himself and those around him. We'll do everything we can to support him through this transition." Dr Tim Anstiss, the Rugby Players' Association independent medical advisor, added: "It is always incredibly disappointing for a player to be forced to retire far sooner than they had planned. "Concussions are to be taken seriously and the RPA is working closely with the RFU, Premiership Rugby and the IRB to fully understand this area and to ensure the sport is doing all it can to prevent concussions, assess them properly and provide proper care for athletes experiencing them. Recent rule changes will enable better assessment during a match, and a clear return to play protocol exists to protect players." Such gutting news to see Nic Berry retire at the age of 28. Great player and top bloke. Will be missed around the club.